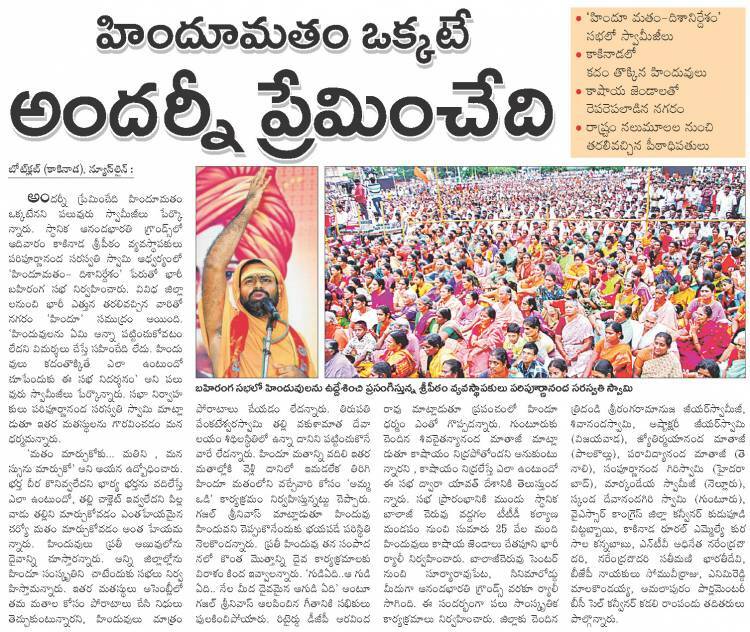 Swami Paripoornananda assembled a massive congregation of people in the city of Kakinada to bring awareness among all Hindus about the greatness of Hinduism and need to preserve and protect it by working together. The whole city was made into a sea of saffron flags. As many as 35, 000 people assembled to hear the message of peace, truth, dharma, tolerance, love, accommodation, adaptation nonviolence, freedom and independence – the unique characteristics of Hindu religion. The spiritual climate pervaded the entire city as thousand and thousands of Hindus ascended the scene form many parts of the State. Swami Paripoornananda, the Pontiff of Sreepeetham, delivered a thundering message reminding Hindus about the message of Swami Vivekananda and others who spoke eloquently about the importance of our culture across the globe and asked the assembled people to follow in his footsteps. Due to the negligence of the leadership, Sanatana Dharma is not being followed adhered to. One does not have to think too much to give an example of the negligence and indifference of Vakulamata Temple in Tirupati. The Vakulamata Temple is in dilapidated condition due to our apathy. It is unfortunate not even one MLA has raised this issue in the Assembly. The saffron philosophy has never advocated the extreme position; it only promotes truthfulness. Only if Hinduism is safeguarded, all the religions can take shelter under it’s umbrella without discrimination. Conversion is creating dissention and hurting the sentiments of Hindus and creating mental havoc in the community. Religious conversion is equivalent to suicide. He reminded the people that Hinduism is known for it’s tolerance and nonviolence and never involved in the conversion tactics. He remembered Swami Chinmayananda’s experience in USA. When an American approached Swami Chinmayananda to change his religion to Hinduism, he politely declined and advised him to do the service to the community. He also announced that he would organize a project called “AMMA VODI” (Mother’s Lap) that will invite all the converted Hindus back to the lap of their mother. No religion should take advantage of the conditions of the people and convert them with bribes and allurements. Swami Paripoornananda said that Hindus respect other religions, respect the people who do namaj three times a day as well as people, who go to churches every week. Hinduism has been generous and invited other religions such as Christianity, Islam, Buddhism and even atheists with open hands to India. Similarly it is should be the responsibility of other religions to respect the people who worship their Deities every day. He even challenged other religious people to have a dialogue on the ancient scriptures of Hinduism. In order to preserve and propagate, he is going to undertake Ratha Yatra starting on November 1 crisscrossing the State. He also announced that in 2013 he is going to organize a huge Global Hindu Sammelana in Hyderabad with 11 lakh people attending the function. Efforts will be made to unite all Hindus and organize groups in each District. He exhorted all the Hindu leaders to fight for the survival and protection of Hinduism. Dr. Ghazal Srinivas, the Honorary Brand Ambassador of SaveTemples organization, thrilled the audience with his powerful speech, and highly patriotic and emotional ghazals extoling the virtues of Hindu culture. He said that the mountain where Vakulamata Temple is located is controlled by Mafia and is being mined illegally; and nearly three-fourths of the mountain has already been mined with no action either from TTD or the government. Hindus must develop self-pride and self respect; honor and practice their religion. He enchanted the audience with his ghazals titled “ Gudi Edi Aa gudi edi.” The song describes the agony of an NRI, who goes to his village after many years, after seeing the Temple in dilapidated condition. Dr. Ghazal Srinivas expressed his disappointment at the situation where Hindus are fearful of declaring themselves as Hindus while other religious people take pride in announcing the religious identity. These days Hindus are afraid to take the Bhagavad Gita to their offices or any public place while other religious people carry their scriptures with pride. Hindus cover their scriptures either with some cloth or newspapers to avoid the condemnation by others as being Hindu fundamentalist. He urged all Hindus to practice their religion, wear their traditional costumes, apply tilak on their forehead and be proud of their heritage. If we fail to recognize the onslaught of other religions, Hindus may end up in museums. He also exhorted all Hindus to donate ten percent of their income for the preservation of their faith like the other religions. Sri Aravinda Rao also spoke about the importance of preserving the roots of Sanatana Dharma. He lamented that that Hindus are failing in establishing their identity with their religion. Other religious people say with pride that they are either Muslims or Christians while Hindu identify with their caste such as Brahmin, Kapu, Kamma, Reddy and so on instead of identifying with their Hindu faith. Sixty Dalit Hind Priests who were trained by TTD attended the function and expressed their disappointment over the treatment they receive from TTD. Now a days, when a Haridasa goes to the villages many householder say that they changed their religion and would not give fistful of rice. On this occasion all the assembled Hindus were soaked in the appreciation of the diverse talents unique and distinctive to the region. Ladies performed Kolatam (a version of Rasa Lila). Colorful dances were conducted highlighting the kirtans of Tyagaraja, Annamayya and others. Haridasas attracted the crowd with their chanting and singing of Lord Hari. Songs, inviting people to come and extoling them to preserve our rich and glorious culture, have drenched them in emotions. 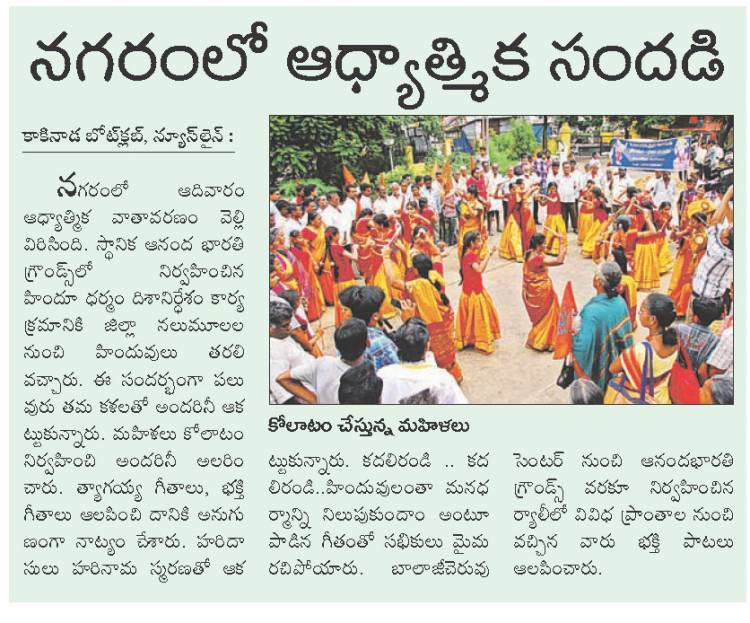 Numerous songs were sung as the procession moved from Balaji Cheruvu Center to Anand Bharati Grounds. Swamijis and Matajis, who spoke on this occasion, include Tridanda Sriranga Raamanuja Jeeyar Swami (Kakinada), Ashtakshare Jeeyar Swami (Vijayawada), Shiva Chaitanyananda Maataji (Guntur), Jyotirmayaananda Maataji (Palakollu), Paravidyananda Maataji (Tenali), Sthiryaanand Saraswati Swamiji (Gudivada), Sampoornanada Swamiji (Hyderabad), Maarkendeyaanandagiri Swamiji (West Godavari District), Skanda Devananda (Guntur), and Sivanand Swamiji of Satyavada. Many of them talked about the importance of preserving Hindu faith and the need to concentrate in the Dalit community to avert illegal conversions. Sri Narendra Chowdary, Owner of NTV, addressed the gathering by saying that this movement should continue further to highlight the importance of Hinduism. Also in attendance were Sri Kuranala Kannababu, MLA; Sri Kudipati Chittibabu, YSR Congress Party; Sri Somu Veera Raju, BJP; Sri Enimireddy Mala Kondaiah; Sri Kadali Ramapandu from Amalapuram; and many others. Following the meeting, Annadana Seva was done for the attendees. Our activities are expanding day by day. With opening of new Office, we will be able to address them more effectively. Aalayavani Web radio and Magazine will be launched in October to reach more and more people. Our expenditure has also increased quite a bit. We are requesting all the individuals and organizations to support financially to continue our movement to free Hindu Temples from the government control and stop the conversions. Dr. V. V. Prakasa Rao, PhD, (601-918-7111 cell), (601-856-4783 home); Prasad Yalamanchi (630-832-2665;630-359-5041); D. Satya (732-939-2060); Dr. K. R. Venkatramaiah (Canada) (416-925-8167); Satya Nemana(732-762-7104); Sekhar Reddy (954-895-1947); Tulasichand Tummala (408-786-8357); Raju Polavaram, MD(919-959-6141); Nandini Velagapudi (601-942-2248); Rama Kasibhatla (678-570-1151); Srinivas Murthy (212-538-8716); Shankar Adusumill (919-961-9584); Rajesh Veerapaneni(773-704-0405); Sunil T Patel (214-293-4740); Raghavendra Prasad; MD (214-325-1969); Gopal Ponangi (214-868-7538); Ram Yalamanchili (214-663-6363); Ravi Pattisam (617-304-3577); Krishna Athota (214-912-3724); Rajendra Narayanadas (214-901-3399); Sesharao Boddu (972-489-6949); P. Srinivas (832-444-6460); P. Viswanadham (972-355-7107); I V Rao (214-284-6227); Sridhar Kodela (214-907-8552); Vijay Kollapaneni (818-325-9576); Ghanashyam Kakadia (469-583-1682); R K Panditi (972-516-8325); Mahesh Rao Choppa (732-429-5217); Viswas Mudigonda (972-814-5961); Satish Reddy (972-724-3232); Srikanth Akula (952-334-9990); Kalyan Jarajapu (972-896-8352) and Dr. Ghazal Srinivas, Honorary Brand Ambassador.